Just a few days short of his 60th birthday, HOWARD JONES launched his new multimedia project ‘Engage’ at London’s Indigo2 with a special live performance. Financed via crowdfunding platform Pledge Music, the ethos behind ‘Engage’ was to curate “a highly interactive live experience designed to immerse audiences in an audio/visual feast” with “EDM, contemporary classical, cinematic and pop music influences” as well as links to ballet and philosophy. He told The Huffington Post: “There’s not so much interest in recorded music, but people love to go to a show. So I was thinking, ‘How can I make an incredibly immersive, visceral experience with all the things that I love all mashed up together?’” Indeed, this was no ordinary HOWARD JONES concert with the first 35 minute set showcasing ‘Engage’ in all its glory with a mix of vibrant accessible technopop and instrumental interludes. This was all accompanied by the thoughtfully constructed hi-tech visuals put together by Stephen W Tayler and projected onto a huge mesh screen which was draped in front of the stage. As the band performed behind the images, it created a suitably impressionist backdrop for new, optimistic songs such as ‘Seize The Day’ and ‘The Walk’. 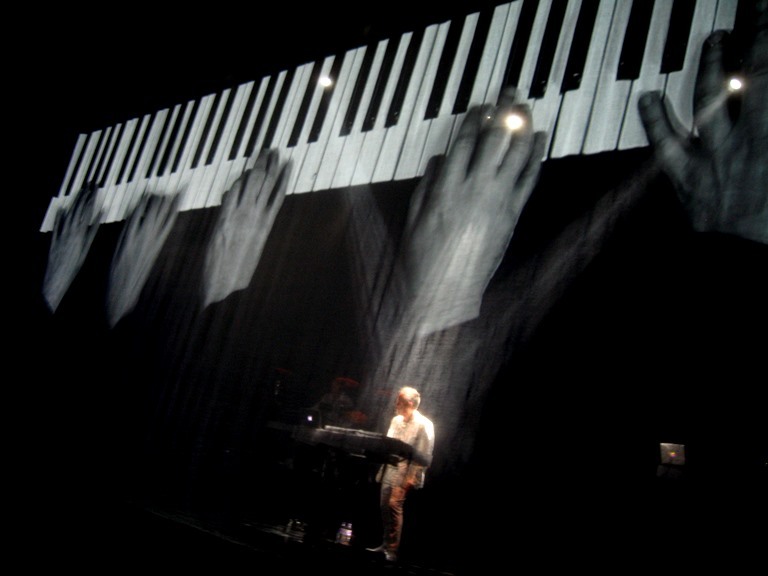 “Get your gloves out” shouted Jones as he prepared to perform ‘Five Pianos’, an abstract piano piece in the vein of avant garde composer STEVE REICH. Those gloves comprised of different coloured fluorescent images which were to be waved in synch with the visuals via a smart phone app following being triggered from the stage. HOWARD JONES’ use of apps as part of the show was novel and innovative… people do seem to spend a lot of their time on their phones at gigs these days, so why not make them part of the show? The mesh screen eventually dropped to reveal Jones, keyboardist Robbie Bronnimann and drummer Jonathan Atkinson with even more fluorescent colours enhancing the percussion and controller hardware being used. 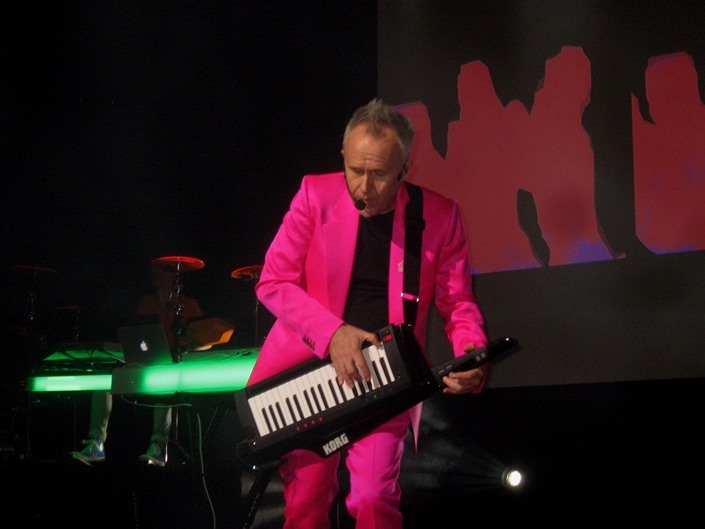 As they performed ‘The Human Touch’, a song that was easily as good as anything on ERASURE’s The Violet Flame’, it proved that HOWARD JONES still has the knack of knocking out a good tune with enlightening, philosophical sensibility after over 30 years in the business. Indeed, philosophy was an important part of the ‘Engage’ live presentation with quotes from Ikeda, Thoreau, Einstein, Kierkegaard and Tolstoy displayed during various sections of the show. 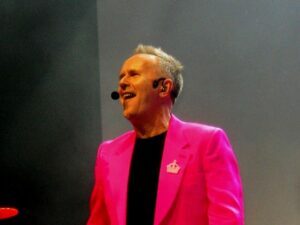 With the audience largely appreciating HOWARD JONES’ sense of ambition with ‘Engage’, he treated his followers for the second longer set with a greatest hits presentation. But before that, he returned to the stage after a short interlude, with a Korg RK-100 strapped round his neck, for a short synth rendition of JIMI HENDRIX’s ‘Voodoo Child’. Making full use of the keytar’s marvellous ribbon controller, it allowed Jones’ to exploit his fine tutored virtuosity. After that, it was all the hits! Beginning with popular standards such as ‘Pearl In the Shell’ and ‘Like To Get To Know You Well’, those in the crowd who had been more muted during the ‘Engage’ set now livened up. Taking in all periods of his career, there was also ‘Everlasting Love’ from 1989’s ‘Cross That Line’ and the terrific but under rated ‘Just Look At You Now’ from 2005’s ‘Revolution Of The Heart’. ‘What Is Love?’ was a terrifically communal affair with lashings of audience participation and the synth man from High Wycombe was clearly enjoying every moment of his early birthday party. “I feel like I’m among friends” he told everyone. In buoyant and talkative mood, he told of how the opening line “You can look at the menu, but you just can’t eat” from his biggest US hit ‘No One Is To Blame’ was inspired by an Elektra Records executive in San Francisco. Asked what he thought of the attractive women that were resident in the city while on a promotional visit, Jones’ replied he was happily married, to which the man from Elektra gave his witty culinary themed retort. There was the fun, electro-calypso of ‘Life In One Day’ which was fairly true to the original but for ‘The Prisoner’, Jones announced to the crowd that he had the guitars taken out and added more synths added. Indeed, he kept his promise with the end result coming over like an enjoyable cross between CUTTING CREW and GARY NUMAN! An extended singalong of ‘New Song’ completed a brilliant main act but the soon-to-be sexagenarian was not done yet! With a solo piano set to start the encore, he began with a more free form take on ‘Don’t Always Look At The Rain’ from ‘Human’s Lib’ which more than revealed his love of DONALD FAGEN, followed by ‘Look Mama’ which was dedicated to his late mother Thelma. There were shouts for ‘Hide & Seek’ and that finally came with a short stripped down version as performed on ‘Live Aid’. But it was then segued into a full synth reprise with a meditative vocodered chant added to proceedings alongside the Buddhist influenced lyrics. ‘Things Can Only Get Better’ finished the night with the 1985 lyric “Get to sixty and feel no regret” summing up what the evening was about. A surprising rave climax to the Top10 song, complete with sawtooth stabs, drops and dad dancing showed HOWARD JONES had no signs of hanging up his keytar. Indeed, he had said earlier in the evening that he intended to carry on for another 10 years! It was a superbly entertaining evening reflecting on the past, but looking forward as well. The superb reproduction of original electronic sounds from the older songs with proved how digitalism can indeed be beautiful, while the new numbers exploited everything that the modern world had to offer. But the important aspect that HOWARD JONES wanted to maintain was the human interaction. And with full live engagement, that was most certainly achieved.